Less known than whiskey but equally rooted in Ireland's cultural heritage, Poitín or Poteen is the name of a spirits made in Ireland since the 17th century in old artisanal homemade copper stills. These family productions were illicit and of variable quality according to the production and the cuvée. 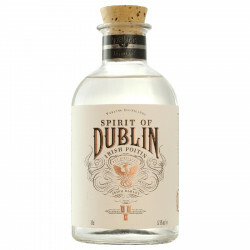 Pronounced "Putch'een", the name Poitín comes from the terms "Poit" which means pot / cauldron and will be the basis of the modern word "pot still" now used to describe a still, and "ín" mark of the diminutive when it is added at the end of a word. Almost forgotten, the Poitín has reappeared in recent years thanks to the Teeling distillery with a quality production that pays homage to this traditional Irish drink not aged. Teeling Poitín is made only from Irish barley - 50% malted barley and 50% unmalted barley, and does not undergo aging. It is a powerful drink at 52.5 °, with interesting qualities. Incredibly sweet and fruity, it is usually drunk pure. Nose: powerful with hints of hot barley, honey and fresh fruit. Palate: fruity and spicy. One is surprised by the aromatic richness and the sweetness which is accompanied by notes of cereals.